Why does the fun part always happen when you are on vacation? I’m glad I brought my laptop to Spain…. 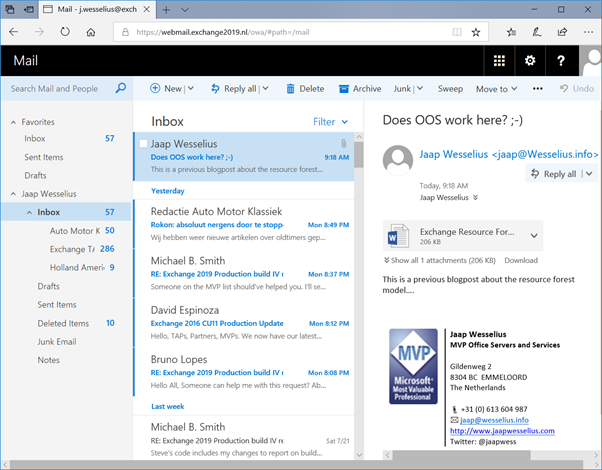 You might have seen by now that Microsoft released a preview version of Exchange 2019. Some people expected that Microsoft was not releasing any new server software anymore, but the opposite is true. If there’s sufficient demand Microsoft will release software. From a version perspective, Exchange 2019 is a major upgrade, but from a technical perspective Exchange 2019 is more a minor upgrade. 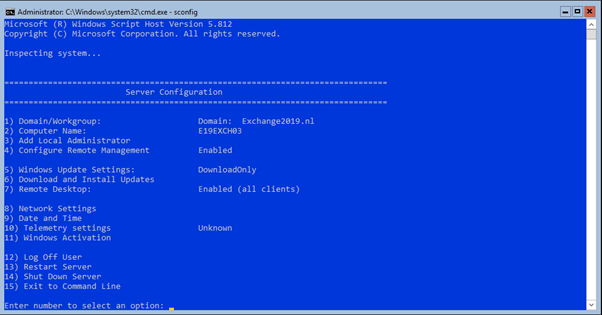 You can see this under the hood, Exchange 2019 is referenced as “version 15.2”, whereas version 15.1 is Exchange 2016 and version 15.0 is Exchange 2013. I will briefly go through these topics in the next sections. One major improvement is the support for Windows Server Core. Yes, finally… Exchange 2019 runs on Server Core. And I must admit, it runs fine. You have to get used to the fact there’s no GUI, and you have to start EMS using the ‘LaunchEMS’ command, but it runs great. Be careful though, it’s a new development and it runs on Windows 2019 Server Core, not a word yet about supportability on older versions of Windows Server Core…. What else can you show about Server Core? Oh, and now we’re talking about supportability, when it comes to coexistence, my guess is (and this has always been the case in the past) that only Exchange 2013 and Exchange 2016 are supported in a coexistence scenario. Exchange 2010 is most likely not supported (N-2 support) so when you are still running Exchange 2010 it’s time to think about a migration strategy (did I already mention Exchange 2010 support will end in April 2020?). If you are running Exchange 2013 or Exchange 2016 you must have experienced issues with indexing and health status of Database copies being ‘unhealthy’. This can become an issue when you want to failover to another Exchange server. In Exchange 2019 this will improve with the introduction of a new search engine called ‘Big Funnel’. Indexing will no longer be in separate files, but it will be included in the Mailbox database. 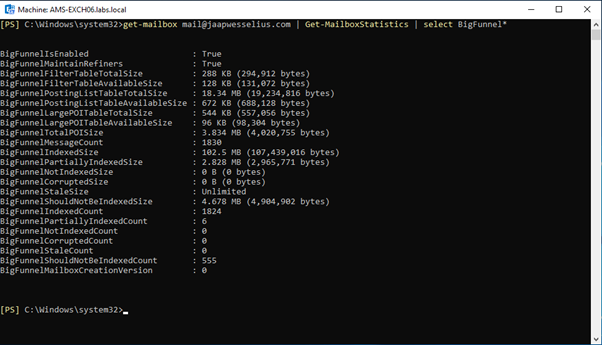 And since Mailbox database copies are always in sync (or at least they should be) this should result is faster failover times, less complexity and less issues. Microsoft does have experience with Big Funnel, it is already running in Exchange Online and in Outlook.com, so it’s not an entire new technology. According to Microsoft Exchange 2019 should support up to 48 processor cores and up to 256 GB. Nice to know, maybe if you’re running datacenters like Office 365, but I don’t have the hardware to validate this I’m afraid. But it’s good Microsoft is also expanding in this area. Some improvements in the User Experience area. Calendaring has always been an issue, and in Exchange 2019 we will see improvements like ‘do not forward’, simplified sharing and better OOF (Out-of-Office) handling. And there will be a Remove-CalendarEvent cmdlet in PowerShell, which allows administrator to remove (orphaned) calendar events, very useful! And more PowerShell improvements, it will be possible to assign delegate permissions using PowerShell! The User Interface is not very exciting compared to Exchange 2013 or Exchange 2016, the good thing here is that you don’t have to educated your end users when moving to Exchange 2019 so that’s a win as well. I have been playing with Exchange 2019 for some time now. When working on-premises it’s best to use Exchange Online Protection (EOP) for message hygiene purposes. The Edge Transport server is still around in Exchange 2019, but nothing special here. 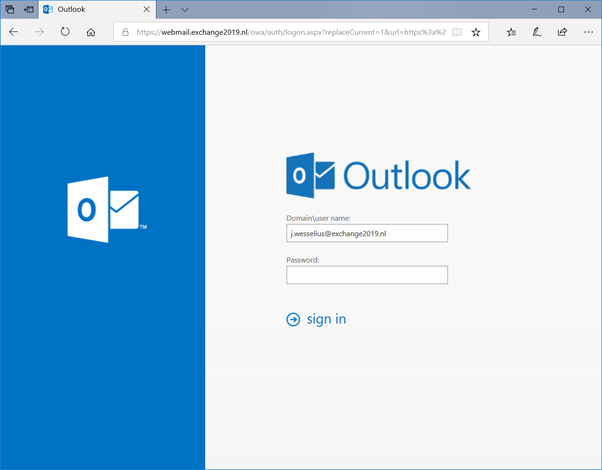 For DKIM and DMARC you still need to use EOP, and using Azure AD Connect is works great. Of course, you can use any message hygiene solution you want, there’s no mandatory requirement to use Office 365 or EOP at all. I have heard rumours in the past, that you need to have a tenant in Office 365, but that’s not true. 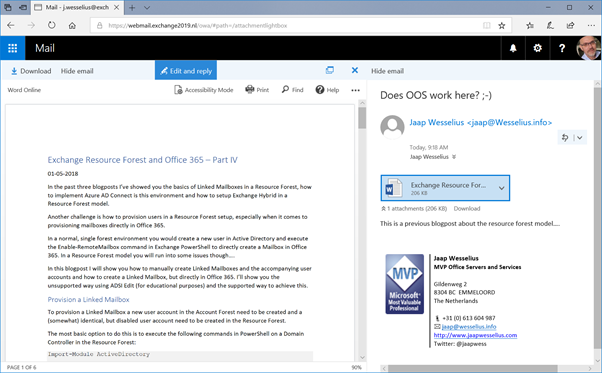 Of course other message hygiene solutions can be used as well, both on-premises as online, but I happened to test with EOP for Exchange 2019. With every new version features are introduced, and other features are deprecated or even removed. 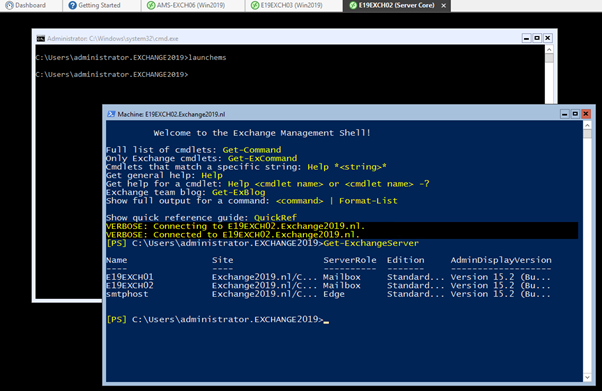 The Unified Messaging server role is removed from Exchange 2019, so if you are using UM you should stick on Exchange 2016 for some time to see how this will develop with cloud alternatives. Or move to Exchange 2019 and also move to Skype for Business 2019 and move to Cloud VoiceMail, but at this moment that’s a bit outside my comfort zone yet. Exchange 2019 Preview is a first look at the new upcoming Exchange 2019, which should be released later this year. I don’t have any insight in a release date, but according to Microsoft a lot more information will be released at Ignite this September (I am going to Ignite, are you? And I’m looking forward to hearing more information). There are some interesting new features, where large organizations will benefit from like the new search engine and the database metcache on SSD improvements. For sure there must be more, but the upcoming months will tell.